In a prior post we showed how extraordinarily ambiguous, long sentences can be precisely interpreted. Here we take a simpler look upon request. Let’s take a sentence that has more than 10 parses and configure the software to disambiguate among no more than 10. Once again, this is a trivial sentence to disambiguate in seconds without iterative parsing! Suppose the intent is not that the telescope is with my friend, so veto “telescope with my friend” with a right-click. You can also affirm that “with my friend” is a complete prepositional phrase within the intent. You can also affirm that “with the telescope” is a complete prepositional phrase within the intent. Suppose the intent is not about a park with a telescope, so veto that “park with a telescope” with a right-click. This leaves on a single derivation as shown below. Instead we can affirm that “in the park” is a complete prepositional phrase within the intent and reparse using the magnifying glass button on the toolbar (all of which is documented with tool-tips displayed upon hovering). and elsewhere at http://linguist.haleyai.com. The lack of a check on “saw” is beyond the intent of this article, but feel free to select it. Doing so has no practical effect in this case. Next, because we have affirmed some parse tree structure, we can use that structure to constrain the parses we obtain on the next iteration. 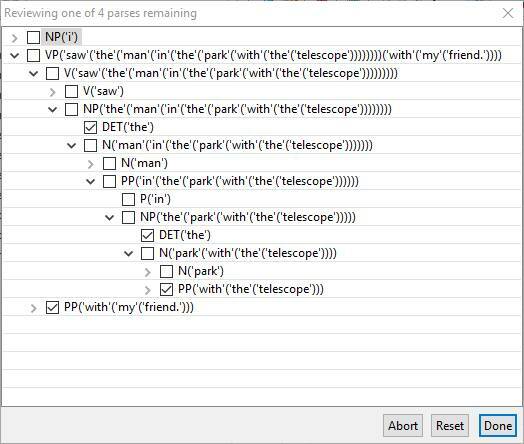 This “Bracketing Dialog” simply reflects the constraints on parse tree structure that we have specified. Any fragment of text can be constrained to remain contiguous during parsing using this dialog. But be careful with it! You can easily choose constraints that are not grammatical, in which case you will find no results! In most cases, this dialog is used to continue refining a parse or to start over, perhaps because of an error or uncertainty beforehand. To use what you’ve specified by affirming parse tree structure, press the OK button. 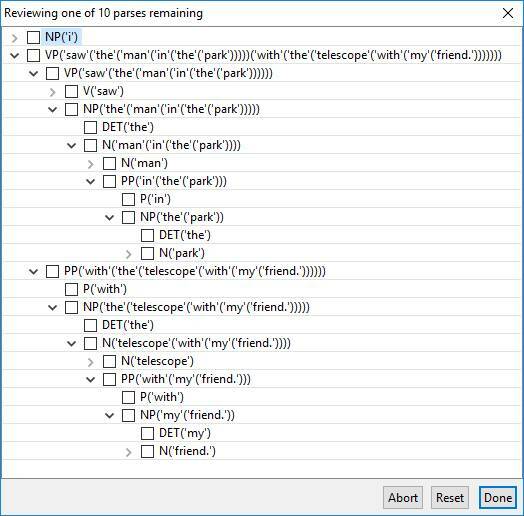 To proceed to reparse without constraining parse structure toggle the selections and then press OK. The cancel button aborts the process of reparsing! At this point, you will receive this dialog. There is a little more grammatical disambiguation that can be done on the clauses tab. For example, whether “saw” is used in past or present tense! 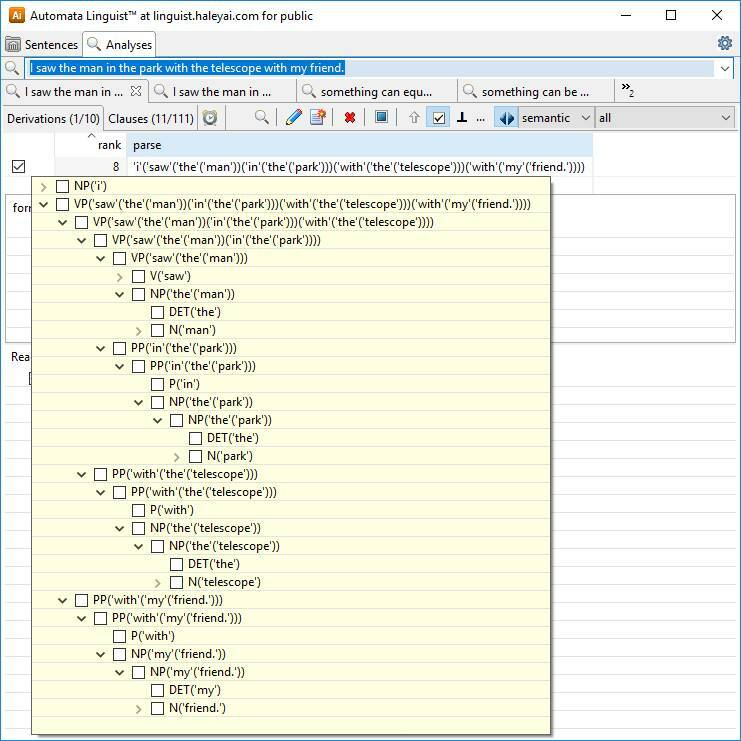 KnowBuddy™ and the Linguist™ addresses each of these so that correct parses can be obtained without extraordinary effort for longer sentences than most systems can handle. 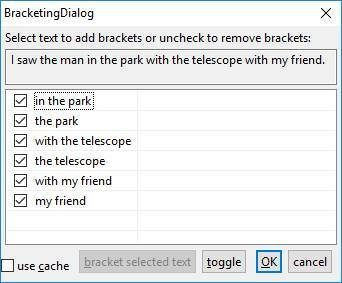 The parsing tab of the settings dialog allows for setting the degree of grammaticality used in parsing. By ambiguity we are referring to the number of derivations (parses) that may be found for a piece of text. Generally, parsing text formally should be used and then use parsing of fragments as necessary. In some cases, however, robust parsing is necessary. The parsing tab of the settings dialog may be used to adjust the amount of time parsing may take as well as the maximum number of parses that may be obtained. Generally, these numbers should be in balance and reflect the degree of grammaticality with which parsing is being performed. For example, to quickly work through relatively short, grammatical text from textbooks, parsing with formal grammaticality in less than 30 seconds with up to 100 derivations should be fine. For less grammatical or longer sentences, 30 seconds for 2 to 4 hundred parses may be appropriate. For longer sentences, a minute or more for perhaps 800 parses may seem necessary. There are facilities in the Linguist that allow even loose grammaticality of long sentences to result in precise parsing, however. It is not unusual to find no parses for a sentence. The following sections address all the above except for unknown words, which are addressed elsewhere. In the 2nd case, there is either an unknown word or the sentence is not grammatical given the “Degree of Grammaticality” settings discussed above. The 1st case above can arise for the combined reasons of too much ambiguity given the parser settings and a lack of grammaticality. By addressing too much ambiguity as discussed here, the latter case, if applicable, becomes evident. As discussed in the section “Degree of Grammaticality” above, ambiguity increases as the degree of grammaticality is relaxed from formal to informal or fragmented text. Even parsing formal text, however, will not avoid the problem of obtaining no parses for some sentences. Lexical ambiguity is easily handled as discussed below and elsewhere (e.g., with regard to parts of speech disambiguation). For any degree of grammaticality, the ambiguity of a sentence increases more quickly than its length. Thus, the first two bullets above are not independent but directly related. For any given sentence, the number of possible parses increases faster than its length. The reason for this is that the parser does not understand the text as person might. Parsing considers plausible interpretations of words, phrases, and clauses and their composition into compound phrases and sentences. This may result in combinatorial explosions. Statistics help order parsing activity and resulting parses in a way that usually makes more sense to human beings who have common sense, but the parser itself knows nothing about meaning. So, when the parser sees “CAN”, it must consider the possibility of that word being a noun for a metal container, a modal verb for ability or possibility, or an abbreviation for Canada. · N possibilities for a single word in the sentence can, in the worst case, increase ambiguity by multiplication with N (although the impact is typically lower due to grammatical constraints). · Note that applications can constrain the parts of speech considered in a variety of ways, including part of speech tagging and limiting the lexicon (e.g., not including “CAN” as an abbreviation). Such ambiguity is “lexical” in that it has to do with words not syntax or grammar. The following are more specifically grammatical. When the parser comes across a prepositional phrase, it may be plausible for that prepositional phrase to complement any phrase that came before it. When the parser comes across disjunctions or conjunctions (which connect 2 or more phrases or clauses) there is frequent and possibly extreme ambiguity in what phrases or clauses it connects. Another common but less pervasive source of ambiguity is compound words comprising more than 2 words. · The parser does not know about carbon, steel, or bearings, so it considers “carbon steel bearings” in the same way it would “steel carbon bearings”. The foregoing are the primary sources of grammatical ambiguity. Each of them is easily addressed using KnowBuddy, as described below. Anyone can learn a lot about ambiguity using KnowBuddy! 1. Start KnowBuddy and log on, if necessary. 2. Open the “public” knowledge-base. 3. Double-click on a short sentence (up to 10 words long). 4. 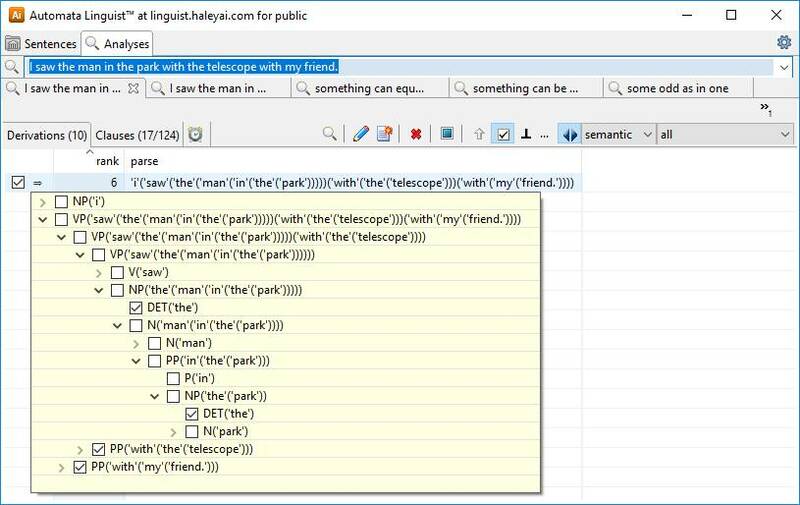 Hit the reset button on the toolbar of the analysis form that opens. 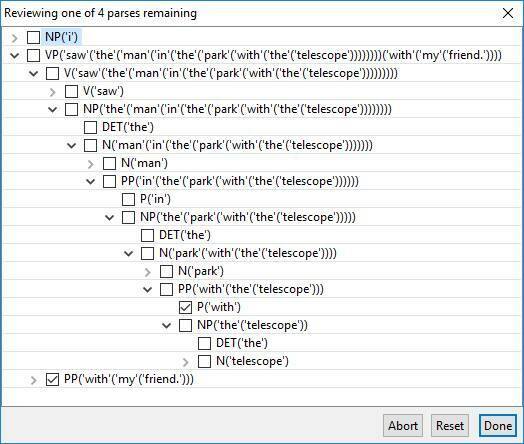 Unless you have settings on the “analysis” tab of the Settings Dialog configured otherwise, you will be presented with disambiguation dialogs containing parse trees and parts of speech. The following assumes you have seen and these dialogs, read about them in documentation provided elsewhere, and used them as encouraged above. Other documentation addresses the various parts of speech and dialogs pertaining to parts of speech that are presented by KnowBuddy and the Linguist. Here we focus on typically problematic sources of lexical ambiguity. · I can mean one as in the roman numeral I or 1. The problem in this trivial sentence is a combination of annoying lexical ambiguity and grammatical ambiguity. · The 1st ‘I’ can be either a pronoun or the roman numeral for one. · The 2nd ‘I’ has the additional ambiguity that it could be a reference to section ‘I’ or the letter ‘i’ itself. · the ‘1’ can be either the integer 1 or the day of the month numbered 1 or the hour of the day numbered 1. · The 1st ‘I’ is a pronoun. · The ‘one’ is an integer or cardinality. · The 2nd ‘I’ is an integer or cardinality. · The ‘1’ is an integer or cardinality. 1. Interpreting a word with a given part of speech is not grammatical. 2. Only incorrect parses are obtained because the appropriate part of speech is not provided. The state of the art in artificial intelligence is that, except for easy words, an incorrect tag is chosen 10% or more of the time. · The math suggests, and empirical results verify, that the state of the art loses the correct parse most of the time (except for trivial sentences). Fortunately, this ambiguity is easy to handle as described here below, but it should be noted that. As suggested above, applications typically configure the system to their needs, avoiding issues that are superfluous given their needs or inconsistent with their requirements. · Roman numerals may not be important in parsing medical text. · Dates and times may not be important in parsing scientific journal articles. · Treating stand-alone uppercase letters as proper may not be important for hand-written policies. · 1st and 2nd person pronouns can be omitted from the lexicon in many cases. · Proper nouns for lowercase letters are typically omitted from the lexicon. · Proper nouns for the names of people, places, or things may be omitted (or augmented). It is not uncommon for governance, risk, & compliance (GRC), policy automation, or decision management applications to prune and control the lexicon aggressively. It is also common to introduce 1st-pass heuristics to reduce disambiguation effort. For example, every sentence with ‘I’ could first be parsed assuming the pronoun. · Such options are incorporated directly into KnowBuddy as appropriate. · Please send suggestions to linguist@haleyai.com. Application-specific pre-processing may also be employed for selective tagging as well as recognizing words that “belong together”. · Please send any compound words that would be generally useful if added to the lexicon to linguist@haleyai.com. In any case, handling even pathological ambiguity should be straightforward using KnowBuddy. Logging in may be bypassed using cached credentials in accordance with the “general” tab of the Settings Dialog. Every new user has access to the “public” knowledge base, but the knowledge-base selection dialog may be bypassed if the last knowledge-base used is automatically re-opened. If so, clear the corresponding setting on the “general” tab of the Settings Dialog and re-launch to open the “public” knowledge base. Familiarize yourself with any toolbar by hovering over its icons or controls and reading the tool-tips. Pragmatically, I is not considered as potential proper (other than as the pronoun) when it is the first word in a sentence. Please feel free to contact linguist@haleyai.com to assess and plan for any potential application-specific needs. N possibilities for a single word in the sentence can, in the worst case, increase ambiguity by multiplication with N (although the impact is typically lower due to grammatical constraints). 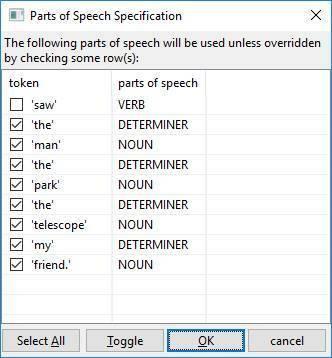 Note that applications can constrain the parts of speech considered in a variety of ways, including part of speech tagging and limiting the lexicon (e.g., not including “CAN” as an abbreviation). The parser does not know about carbon, steel, or bearings, so it considers “carbon steel bearings” in the same way it would “steel carbon bearings”. Start KnowBuddy and log on, if necessary. Double-click on a short sentence (up to 10 words long). Hit the reset button on the toolbar of the analysis form that opens. I can mean one as in the roman numeral I or 1. The 1st ‘I’ can be either a pronoun or the roman numeral for one. The 2nd ‘I’ has the additional ambiguity that it could be a reference to section ‘I’ or the letter ‘i’ itself. the ‘1’ can be either the integer 1 or the day of the month numbered 1 or the hour of the day numbered 1. The 1st ‘I’ is a pronoun. The ‘one’ is an integer or cardinality. The 2nd ‘I’ is an integer or cardinality. The ‘1’ is an integer or cardinality. Interpreting a word with a given part of speech is not grammatical. Only incorrect parses are obtained because the appropriate part of speech is not provided. The math suggests, and empirical results verify, that the state of the art loses the correct parse most of the time (except for trivial sentences). Roman numerals may not be important in parsing medical text. Dates and times may not be important in parsing scientific journal articles. Treating stand-alone uppercase letters as proper may not be important for hand-written policies. 1st and 2nd person pronouns can be omitted from the lexicon in many cases. Proper nouns for lowercase letters are typically omitted from the lexicon. Proper nouns for the names of people, places, or things may be omitted (or augmented). Such options are incorporated directly into KnowBuddy as appropriate. Please send suggestions to linguist@haleyai.com. Please send any compound words that would be generally useful if added to the lexicon to linguist@haleyai.com. In a prior post we showed how extraordinarily ambiguous, long sentence can be precisely interpreted. Here we take a simply look upon request. 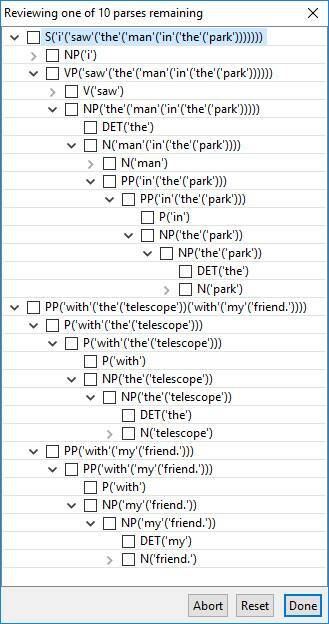 To use what you’ve specified by affirming parse tree structure, press the OK button. To proceed to reparse without reparsing toggle the selections and then press OK. The cancel button aborts the process of reparsing!